This article provides information about the different AT&T Office@Hand Login Integrations. Office@Hand has integrated different methods on how to log in and access Office@Hand products. You now no longer need to remember your phone number when logging in. You can just log in with your email or with your Google credentials, depending on your preference. Users need to have a unique email address to enable this feature. Existing Users with unique email address can log in immediately with their email credentials after the update. Existing Users who log in with their phone numbers will be notified with a pop-up message about the feature and will be given the ability to set their email addresses as unique. 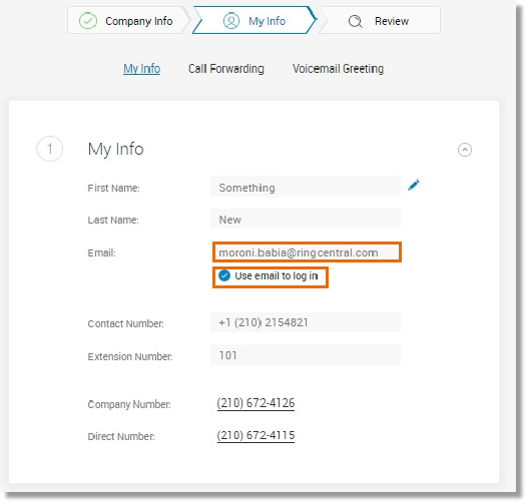 Administrators and Users can enable this feature in two (2) ways: through Express Setup or through User Details. Make sure the Use email to log in radio button is enabled. QUICK TIP: See Adding Office@Hand: Adding or Deleting Extensions via online account to know how to add a User. In the event that a User’s email address is not unique, an Alert window may appear. This can happen when there is another User in the same account has the same email address. It can also happen when the same email address is used in a different account. When clicking the Verify Email Uniqueness button, the Duplicate Email Association window may appear. 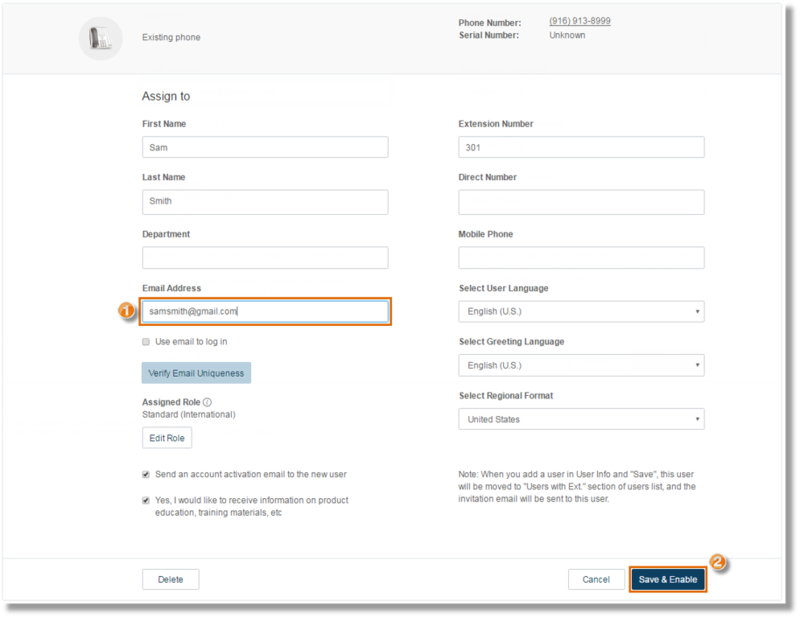 Administrators can edit a User’s email address by simply clicking on Edit and then, changing the Email Address. Click Save to confirm and OK to exit the window. 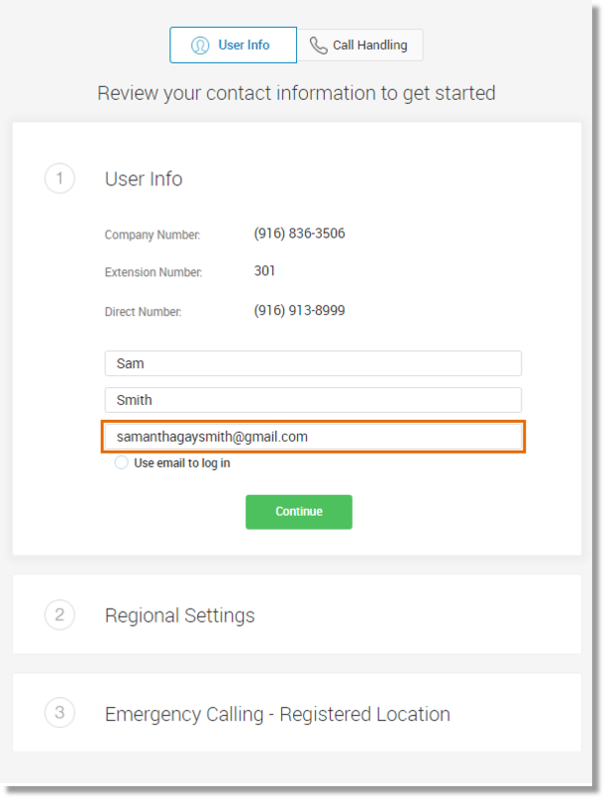 Administrators and Users can log in with their unique email address. Just select Email when logging in to your Office@Hand account. For the detailed instructions, see Office@Hand: Logging in to your Online Account with Email. When enabled, Administrators and Users can log in with their Google credentials. When assigning extensions – This can be done when an Administrator is activating a new User to the account. 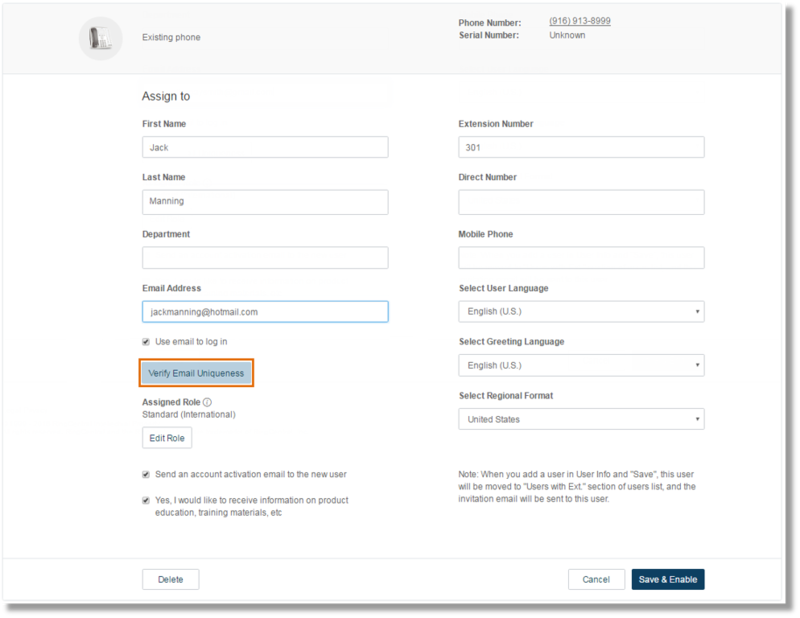 Administrators can go to Admin Portal > Users, then click Unassigned Extensions > select the Unassigned Extension Name you want to activate. Once selected, enter the email address of the user and click Save and Enable. 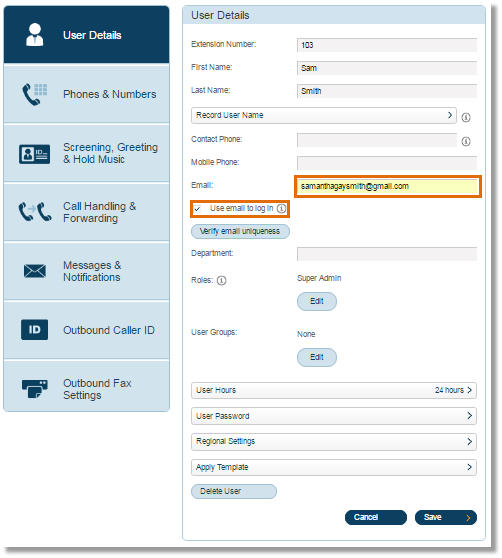 During initial setup with Express Setup – Enter the User’s email address in the field provided. Leave the Use email to log in radio button disabled. By adding or changing the email in the User Profile – Administrators can do this by going to the Admin Portal > Users >select a User > and under User Details, enter the Google email in the email field and then, click Save. Leave the Use email to log in radio button disabled. If a User tries to log in using a valid Google email address that has NOT been registered with his/her Office@Hand account profile, a warning dialogue box may appear saying that the email is not registered. You may click on the link to sign up or add your Google credentials to your Office@Hand account. If the same Google email address has been registered in several or multiple accounts, a warning dialogue box may appear saying so. You may need to contact your Account Administrator to verify your email uniqueness and set this up for you. Administrators and Users can log in with their Google credentials. Just select Google when logging in to your Office@Hand account. For the detailed instructions, see Office@Hand: Logging in to your Online Account with Google.